Grandparents’ Day celebrated at Our Lady of Fatima Elementary. On Thursday, September 8th, a capacity crowd of students, faculty, parents, and special guests – grandparents filled Our Lady of Fatima Church as we honored grandparents. Father Henry celebrated a special Mass dedicated to the grandparents. During his homily he stressed the importance of knowing your grandparents and the special part they play in the family. Involved grandparents can make a big difference in the lives of their grandchildren. A strong emotional bond with the grandparent models a healthy relationship.. After Mass the grandparents were treated to a special brunch in the cafeteria served by the 6th grade students of Our Lady of Fatima. National Grandparents Day is observed on the first Sunday of September following Labor Day and was signed into law by President Jimmy Carter in 1978. 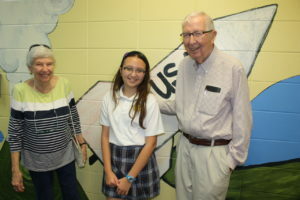 Our Lady of Fatima Elementary has an active grandparent’s club. The club is led by Ms. Dinah Jordan. We thank her for all the work she does in overseeing this group.